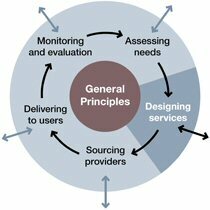 After assessing needs, commissioners need to plan or design the service(s) to meet those needs (part of the ‘Plan’ or ‘Procuring services’ are in some commissioning cycles). Establishing and agreeing the outcomes to be achieved by the service is critical for this and the remainder of the commissioning process. Do I know what needs I have to meet? Have I consulted third sector organisations (among others) about those needs and how to meet them? Have I collaboratively agreed the outcomes chosen to meet those needs? Are the outcomes defined in a SMART way? Can I achieve more by joining my outcomes with those of others?